This article explains the possible cause of the error event Event 1059 and gives solution to resolve this issue, also gives the useful reference links to solve issue. 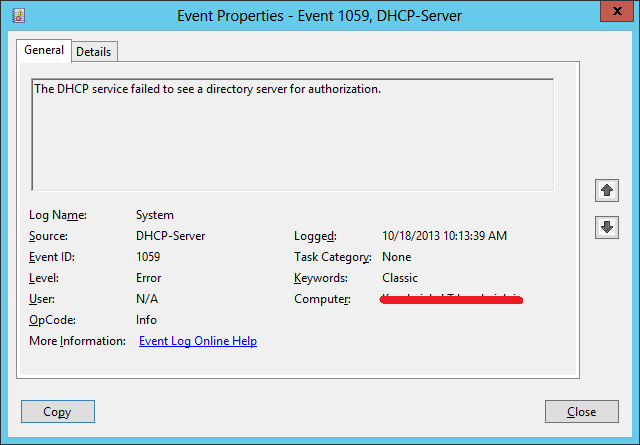 The DHCP service failed to see a directory server for authorization. After I have googled and analyzing this issue in my work environment found the 1046 also logged followed by event 1059. and noticed the service Remote Procedure Call (RPC) has been stopped, restarting this service solved will solve the DHCP related issues.